Honestly, I’m still in shock: this year went by in a blink of an eye. 2016 was, personally and professionally, the best year in my life… YET! Turned eight years old in the industry! Time did fly! There was no one to drive us, so I drove a client’s car with no particular destination in mind just so we could take pictures somewhere before the Ceremony. The results were beautiful. Did 45 weddings, making it my most active year yet. Got a couple of weddings featured, but my favorite accomplishment was being selected as one of the Wedding Wire Editor’s Picks for 2016 with this beautiful beach wedding. Spent 75 days shooting. Splitting the remaining days from these 75 projects, it meant that for each project, I had four days left for editing, meeting new clients, and living in general. What a busy year! Had a lot of rainy weddings! After a year of drought, this year was the total opposite. Rain didn’t stop us for even a second, though! I had traveled for weddings before, but this year, I also did it for an engagement session. Shot more marriage proposals than ever. Growing wedding photography trend for 2017? Probably. My most repeated venue was Hacienda Siesta Alegre. Just on 2016 I shot a total of 12 weddings there. Traveled to the WPPI Convention in Las Vegas and got more excited and inspired than ever for my wedding photography business. Fell in love with my job, my clients, and the incredible experiences I get to live working with them. It’s difficult for me to choose favorites between my photos, since my clients and their weddings are all so awesome. So, just like last year, I’m doing a recap of the most-viewed wedding and engagement session blogs for 2016. Before I go on with the best weddings of the year, I have to thank every single client, vendor, and reader… You are all the engine that keeps such beautiful things happening! It has been, historically, and eventful and overwhelming year, but I’m happy to work in the love industry and continuously experiencing how much love and good vibes are still happening daily. I wish you all a beautiful, blessed and photogenic 2017 full of loving memories to cherish forever. And I’d be excited if I’m capturing them for you. After a couple of ‘failed’ attempts to find the perfect engagement session date while Brigitte and Julian were in Puerto Rico, I flew all the way to the city that never sleeps in April to capture their engagement session. It turned out perfectly, as the city was covered in colorful florals for their session. 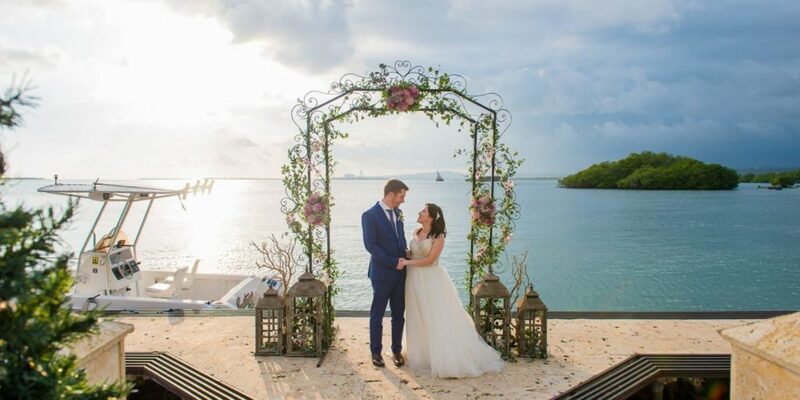 Arys & Ciaran opted for a beachfront wedding venue, but being in Puerto Rico you can go beach to country quickly, so we also stopped for beautiful photos in the countryside of Coamo. Natalia and Mauricio had a gorgeous hacienda wedding with a detour from the usual rustic, earthy tones to brighter and lively ones. I also loved Mauricio’s polka dot shirt and blue suit combination. Brigitte and Julian went big at their wedding day, having a great team of wedding vendors, glamorous decor, and amazing entertainment for their guests. But all the luxury in this wedding was not the thing that stood out the most, but the love and excitement that was felt during this day. Paola and Ricardo started out wanting something simple for their wedding. But their family insisted they gave the big wedding a try. They had it their way, with a beautiful minimalistic al fresco wedding with dozens of their loved ones. Darylis and Caleb are a handful! I totally enjoyed their engagement session, where we walked all over Old San Juan finding the coolest, most colorful spots for engagement photos. They had romance, fun, and even some batucada dancing in the streets of San Juan. Danielle & Edwin wanted a photojournalistic approach to their destination wedding, with less atttention to portraits and poses, and more to candid photos and people having fun. Luckily, there was a LOT of fun for me to capture. Ambar and Miguel had a picture-perfect whimsical rustic wedding at the gorgeous Hacienda Muñoz. They had a lot of fun and every second of their day was pure bliss. Jeyrick hired me to ninja-papparazi-style document his proposal to Kathia at the beautiful Royal Isabela Resort, where they were supposed to attend a “work dinner”. To Kathia’s surprise, she found Jeyrick in one knee, and all their close relatives excited about the engagement! Having shot their beautiful, carefully planned surprise proposal, we were already very excited about their engagement session. Rather than an Old San Juan or beach session, they opted to go adventurous for this session. Their countryside engagement session resulted in some of my favorite portraits ever. This beach destination wedding got awarded a spot in the top 10 WeddingWire Editor’s picks for 2016. Being selected among over 600 real weddings showcased, and the fact that it was Brad and Kevin’s, made my heart sing. It was such a beautiful, honest, and emotional day, that I’m proud their event got nationwide recognition.